Sleep issues are often the result of an overactive mind at bed time. Glo to Sleep - Sleep Therapy Mask will help you focus your mind on the process of relaxation and sleep - naturally and effectively. Have you ever been lying awake in bed when you should be sleeping? You're tired but can't switch off your mind and get to sleep? You're thinking about everything you have to do tomorrow, and you didn't get done today, but worst of all, what's keeping you awake is worrying about how you can't fall asleep. Whether it's for a full night's sleep or just for a nap, the unique technology will help you fall asleep quickly, stay asleep longer and wake up feeling rested. Put on this Glo to Sleep Mask, gently raise your eyes upward, hold your gaze on a soft blue Point of Glo that appears inside your mask, and breathe deeply. When using Glo to Sleep, the objective is no longer “ trying to fall asleep”. Simply raise the eyes and hold the gaze on precise pattern of blue glo and breathe deeply. Thoughts slow and the mind clears. The body relaxes and arms and legs feel heavy. The eyelids begin to feel heavy as the individual continues to gaze at the Point of Glo. What happens next is what many GlotoSleep users find so amazing: the transition from consciously looking up at the blue Points of Glo to the first stage of sleep often seems instantaneous. At no time is the user thinking "they must get to sleep". The Glo to Sleep™ rapidly slows the brain's activity level to a deep relaxed state. Looking up at the blue Points of Glo will be the last thing the user remembers upon awakening. Your thoughts will slow and your mind will clear. Tension will leave your body. You will become deeply relaxed and quickly be asleep. Some users report it seems to use the principles of self-hypnosis and meditation to lull you to sleep. 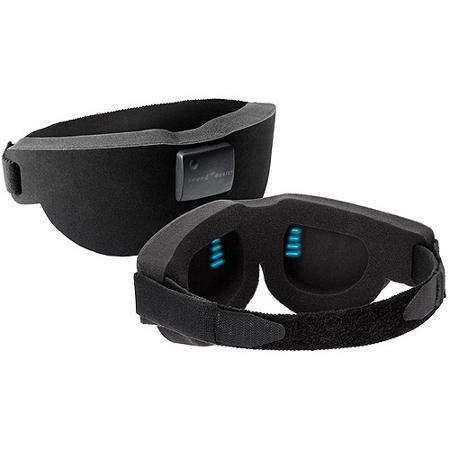 To activate the GloToSleep Mask, hold it under a light source for about 30 seconds. The charge will last for several hours. What lights work the best? Any reasonably bright light source will work. Brighter light sources, like sunlight or halogens will activate the Glo to Sleep faster. Be careful with hot light sources though, like halogens - keep the Glo to Sleep about 6 inches away to prevent any damage. Fluorescent lighting will work, but is less effective. Blue Points of Glo inside the mask help you focus your mind on the process of relaxation and sleep – naturally and effectively. This meditative approach calms your mind and effectively moves it to a relaxed state. Glo to Sleep effectively blocks out unwanted external light allowing you to more easily get to sleep, stay asleep and enjoy higher quality sleep. Recessed eye pieces block out all outside light and allow the eyes to blink normally. Great for travellers too as eye-make up won't smudge and you won't wake up with a sleep-mask pattern on your face. A soft adjustable Velcro® strap fits all head sizes. The Deluxe model provides precise lighting control so you can choose the exact brightness level dimming that's right for you. Made of same hypoallergenic foam as the regular mask. Pressing a single button turns the Points of Glo blue. Slip on the mask and watch the Points of Glo dim while breathing deeply taking your mind from an active Beta state to the relaxing Alpha state. Glo to Sleep Deluxe allows you to set the dimming period to match your personal taste. The Points of Glo can be set to gradually dim in 10, 20 or 30 minutes. Glo to Sleep Deluxe blocks out all unwanted external light so your body is able to release natural, sleep inducing melatonin. Perfect for nightly use at home or while traveling. Batteries included (CR-2032) for Delxue model. All materials are hypoallergenic and environmentally friendly. The Points of Glo are inert, non-toxic, and give off only the light they have absorbed. Designed in North America.